The latest episode of the BBC2’s “Planet Word” has Stephen Fry, cast in the role of the Master of Laketown, speaking with Peter Jackson about Tolkien’s use of languages in The Hobbit and The Lord of the Rings. Yet feet that wandering have gone, return at last to home afar. Look at last on meadows green, and trees and hills they long have known. 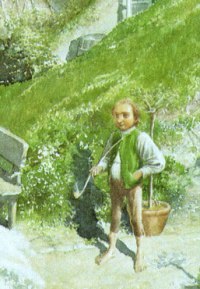 Stephen Fry’s recital of Tolkien’s poem sets the tone for his little discussion with PJ in a most apt setting – the Bag End set down in New Zealand, where filming for the upcoming Hobbit films is currently on in full swing. Folks in the UK can watch the stream via bbc.co.uk, while those located internationally can catch a snippet over on YouTube (4:17 into the video). A transcript is also up on our message boards courtesy of board member QuackingTroll.